Welcome to the strange, eclectic world of Mr. John F.D. Taff. His debut publication stitches together 19 tales representing his literary work to date, held together beneath the spooky, gorgeous cover by artist Diego Candis. The stories inside are kept short enough to ensure readers can dig through at least a couple before the swirling images of John’s nightmare landscape give way to their own disjointed dreams. And while you can’t please everyone, as the author admits in his personal notes concluding the stories – a welcome bonus, I might add – the sum of this collection ought to please most who dare enter its formidable world. Twenty years in the making, Little Deaths opens with the author’s ode to classic monster movies with Bolt, a darkly humoured ditty about the perils of a man who collects everything except the sense to know when to let dead things rest, even if the dead thing happens to be his significant other. Often poetic, Taff infuses his craft with an obvious flare for the macabre. You’re not going to find any hack ’em slasher tales here that rely on shock and gore alone. Prepare to come face to face with a brooding, permeating fear, the kind of living thing that crawls from the pages and burrows deep into your subconscious where it festers long after the lights go out. The little deaths compiled here celebrate a much more intimate look into our collective dark hearts than anything else you might find waiting beneath your bed. While most of the tales tend to have at least some form of supernatural element, certain selections like one of my personal favorites, Box of Rocks, rely on the malevolent side of man’s own deed. The author proves that as effortlessly as fear transcends all borders, so, too, does John’s writing style stretch beyond the boundaries of any singular arena that might otherwise restrain his unchained muse. With stories like Snapback or The Mellified Man (another personal favorite) it’s easy to say well, that’s sci-fi or that’s horror, but more often than not the only common string connecting each tale, other than the poignancy of the environments in which they’re created in, is that they don’t exist in worlds where happy endings have any chance of survival. 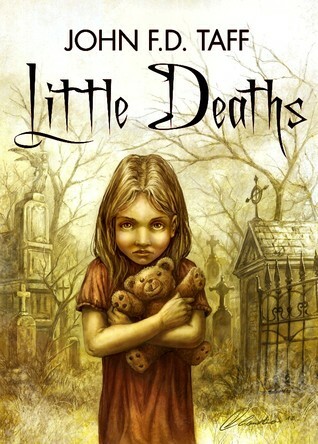 The only aspect of Little Deaths that I found to put some distance between me and its characters is that with many of the stories showcased here, the terrible fate and atrocities surrounding the protagonists often comes across as a bit too… accepted, even embraced as was the case with stories like In Men, Black and The Water Bearer. To be fair, this hardly rendered the fate of these characters any less tragic, but I’ve always preferred my victims fighting against whatever opposition they face as if their lives depended on it, as if the thought of being transformed beyond their will was a thing of absolute terror rather than an anticipated, unavoidable end. Then again, maybe the greatest fear of all is knowing that each of us has a little death waiting just around the corner whether we recognize its face or not; a haunting reality that John F.D. Taff captures with razor sharp effect, ultimately making Little Deaths a definite must read for the fear connoisseurs among us.